View Poll Results: JP LG-58 Clonebots - worth buying? Fastlane’s obvious kibble really detracts from the ‘you can’t tell which clone is which’ concept. When I saw their little jet and car symbols on their chests I thought ‘Oh cool! Rubsigns!’, figuring that since it was a hot day they must already be heated. Imagine my disappointment when I found they were just stickers, which means you can permanently tell one from the other. The other disappointment here is that neither bot comes with his dual hand weapons. Given the cost of the figures, I think it’s a bit lousy for them to not come with their guns, especially since they could be used in either mode by the original figures. 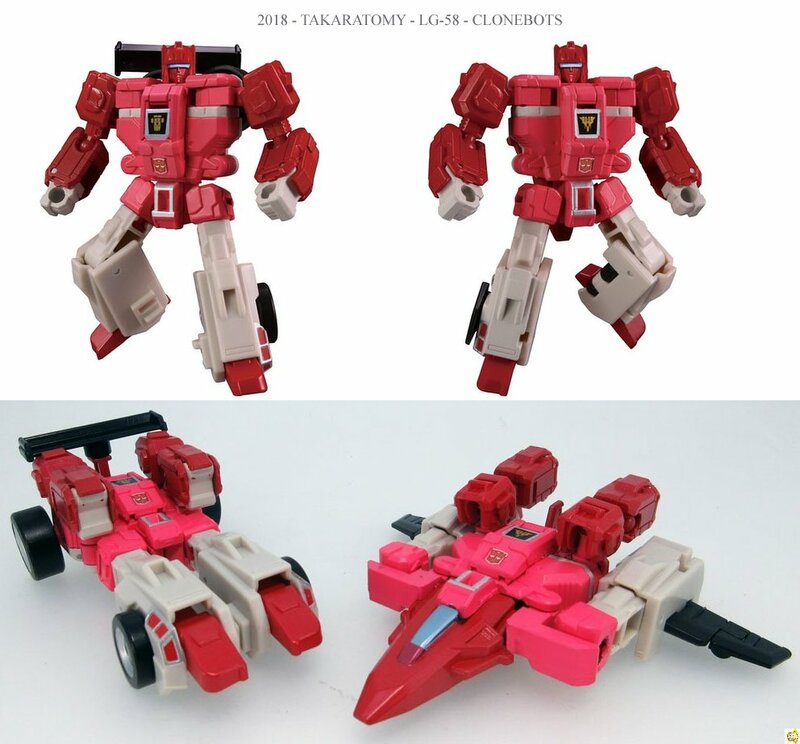 Cloudraker is OK in vehicle mode but Fastlane is fairly weak, so unless you are like me and want every Classicsverse version of every G1 character you can get, these two are an easy pass. I've pre-ordered mine from TLTC so not sure if I'll receive them before Easter or not. :/ And their price works out to be roughly the same as HLJ after shipping. Meh. As for having no weapons... I don't remember any Legends Class Combiner Wars or Titans Return or even POTP toy coming with a weapon. Yeah I know. But I had hopes. Between A: a Hasbro rep in 2017 talking about how Fastlane is bigger and has more complexity than an average legends class figure, and B: Takara's penchant for giving their toys guns when the Hasbro version didn't have any (Pistols for the UW Constructicons, Targetmasters for the Legends line etc) I held out hope I'd see some guns given to these two. Thus I was disappointed (though not surprised) when they came without them.